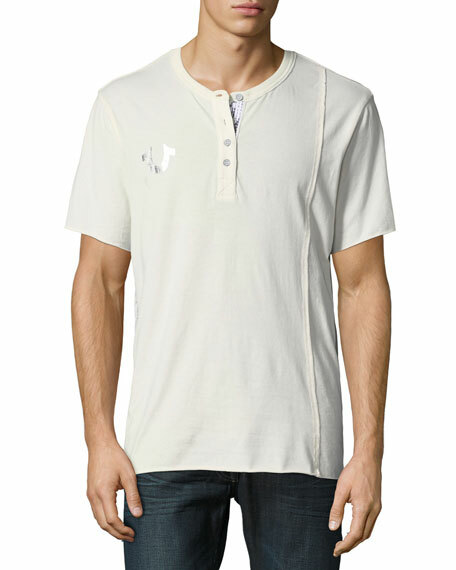 True Religion henley shirt with raw edges. Peter Millar smooth lisle knit polo shirt. Approx. measurements: 28"L from shoulder, 32"L from back. Spread collar; three-button placket. Short sleeves with banded cuffs. Vented hem; pullover style. Cotton; machine wash. Imported. Model's measurements: Height, 6'1"/185cm, waist 32"/81cm, suit 40L, shirt 15x34, inseam 32"/81cm. 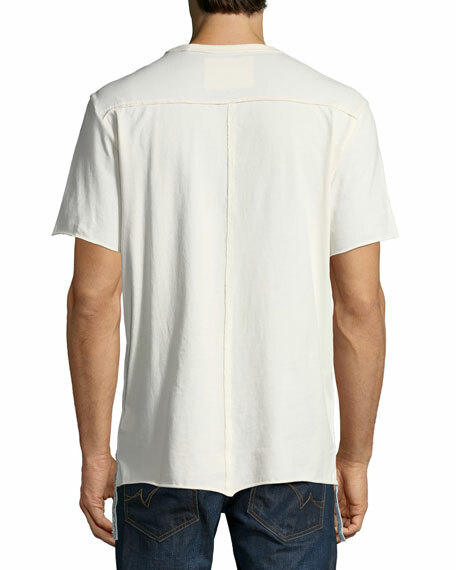 Rag & Bone Standard Issue "Beach" shirt in double gauze. Point collar; button front. Short sleeves. Chest patch pocket. Shirttail hem. Classic fit. Cotton. Imported. Model's measurements: Height 6'1"/185cm, waist 32"/81cm, typically wears size M.
Rag & Bone Standard Issue classic Henley T-shirt in garment-washed mélange. 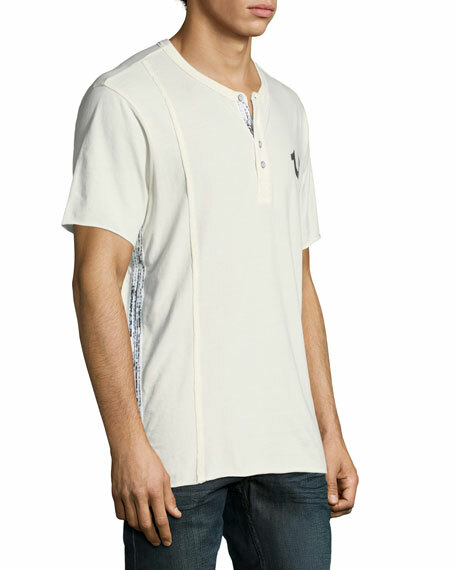 Crew neckline; three-button front with woven placket. Short sleeves. Rag & Bone Standard Issue classic Henley T-shirt in garment-washed mélange. 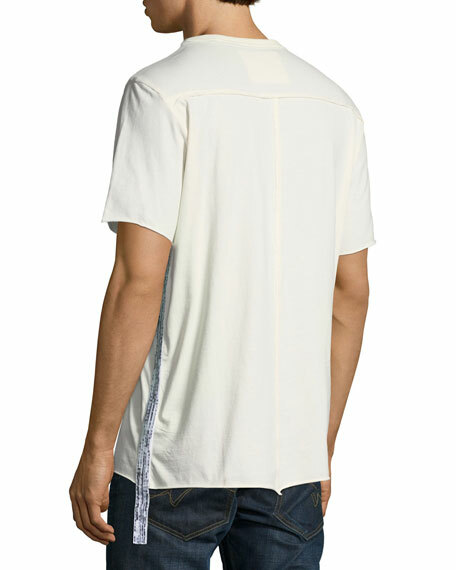 Crew neckline; three-button front with woven placket. Short sleeves. Pullover style. Slim fit. Cotton. Imported. Model's measurements: Height 6'1"/185cm, waist 32"/81cm, typically wears size M.
Robert Graham printed shirt. Spread collar; contrast print. Short sleeves; banded cuffs. French-placket button front. Yoked back shoulders. Shirttail hem. Robert Graham printed shirt. Spread collar; contrast print. Short sleeves; banded cuffs. French-placket button front. Yoked back shoulders. Shirttail hem. Cotton. Imported. Model's measurements: Height 6'1"/185cm, waist 32"/81cm, typically wears size M.